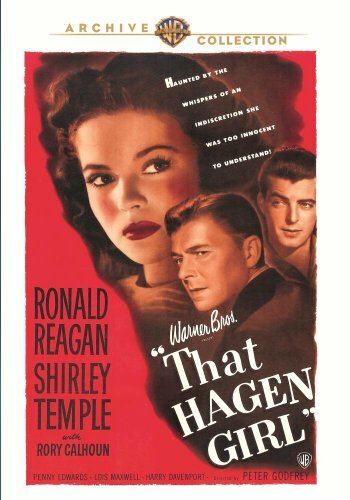 "That Hagen Girl" shows what hateful gossip does and does not do to characters played by Shirley Temple and Ronald Reagan. Gossip aims to hurt, not to clarify. It can have a long shelf-life since its practitioners skulk behind their subjects’ backs. What will happen when those most hurt by hateful rumors join ranks in “That Hagen Girl”? In 1981, thirty-seven years after the release of "That Hagen Girl," Shirley Temple worked again with Ronald Reagan. During his presidency, Shirley served as Foreign Affairs Officer-Expert with the Department of State (Foreign Service Institute). 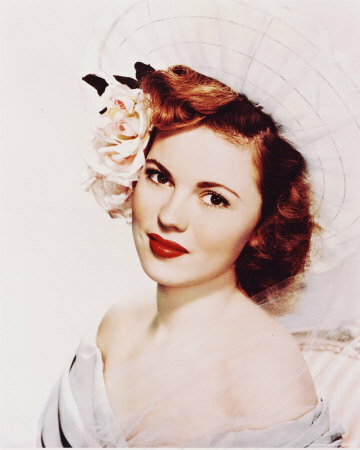 Shirley Temple, circa 1948, after making "That Hagen Girl"
Gossip does not consider facts in That Hagen Girl by writer Charles Hoffman, producer Alex Gottlieb, and director Peter Godfrey. Karl Freund, David Weisbart, and Franz Waxman handle cinematography, editing, and music. Filming showcases California’s Burbank and Universal studios. The 83-minute film adapts Edith Kneipple Roberts’ (born 1902) 1946-published, same-named novel. Its distributor was Warner Bros. Its NYC-premiere and USA-release dates were October 24 and November 1, 1947. The movie begins with Jim (Charles Kemper) and Minta (Dorothy Peterson) adopting baby Mary (Shirley Temple) from an orphanage in Evanston, Illinois. Their return coincides with that of wealthy Trenton (Moroni Olsen) and Lorna (Barbara Brown) Gateley’s daughter. Townspeople find Grace’s (Kyle MacDonnell) and Mary’s eye and hair colors similar. Tom Bates’ (Ronald Reagan) guardian Judge Merrivale (Harry Davenport) considers the rumors. He funds Tom’s law schooling elsewhere. He knows that Grace’s insanity -- not (non-existent) pregnancy -- provokes the couple’s break-up as boyfriend/girlfriend. Two decades later, Tom is back in Jordan, Ohio. His guardian is dead. He meets Professor Julia Kane (Lois Maxwell) at a college dance. Mary exits for a wardrobe malfunction. Dewey Koons (Conrad Janis) grabs Mary for a kiss. Julia keeps Mary from punishment for behavior unbecoming to a college student. Mary visits Chicago, Illinois after fellow student Sharon Bailey (Jean Porter) reveals the rumors. Julia asks Mary to perform in “Romeo and Juliet” by William Shakespeare (1564-1616). Wealthy Ken Freneau (Rory Calhoun) asks Mary to his fraternity’s dance. Mary welcomes the change from kind friend to romantic date. Board members (Florence Allen, Ed Russell) force Julia to have wealthy Herb (Douglas Kennedy) and Selma (Winifred Harris) Delaney’s daughter Christine (Penny Edwards) interpret Juliet. Molly (Nella Walker) forces her son to take Christine to the dance. Ken gets Christine drunk. As Christine’s substitute, Mary saves the day. She says “yes” to becoming Ken’s fiancée. Jim sharing Mary’s suicide note. Taking a train with Mary to pursue career and romance elsewhere.